Glad to see the updated menu. I made changes now that I see the new choices. Same for tomorrow to IAD. Will try and report back. Undecided at the moment. I am flying lhr/iad on 5/29 in F. I pre-ordered the Louisiana fried chicken from the menu shown on BABoy84's post above. I didn't want to order the beef cheeks as I felt they would be well done. Has anyone had this chicken entree? Was about to post this for HKG later this month. A disappointing menu for the new service. Update: do NOT get the beef. Will post more on the appropriate thread, but was strange little chunks of overcooked beef rather than anything resembling a proper steak as I've had in WTP before. Hardly believe it was one of the 'CW'-touted mains in WTP. Worst meal I've had on BA ever, full stop, considering expectations per cabin etc. Sounds like gluemeat, Thx for the heads up! Chicken looked bog standard, albeit edible and recognisable. Good luck - not impressed with the menu by any means. Update: do NOT get the beef. Will post more on the appropriate thread, but was strange little chunks of overcooked beef rather than anything resembling a proper steak as I've had in WTP before. Hardly believe it was one of the 'CW'-touted mains in WTP. If the menu says "braised beef", it's not going to be a steak! From your photo in the other thread, it looks like braised beef is exactly what you got, and ISTR some reports from CW passengers that it tasted better than it looked. At any rate, braising is one of the cooking techniques that will avoid the meat getting incinerated and dried out, as is so often the complaint about BA steaks. Certainly fair, though have had 'braised' beef on BA and was certainly different. Either way, was not good and did not have any of the aspects that one expects of braising. 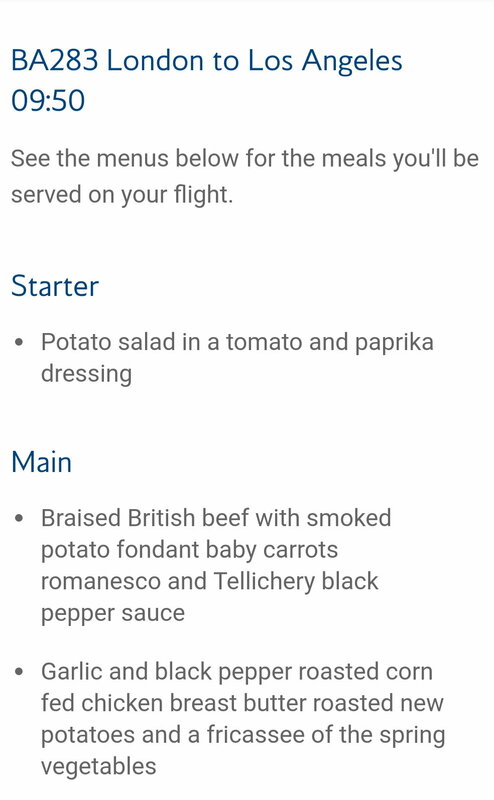 For instance - my post number #2335 in the BA food photographs thread shows a 'braised beef.' I know WTP doesn't get the new CW mains, but BA use 'braised' quite liberally.